GN500 GPM mud cleaning and mud recycling system is a popular size mud treatment system for water well drilling, HDD and CBM drilling. It is a compact design integrated mud system. It is composed of 3 stages solids control and the mixing system. In order to suit the requirements of different jobsite, GN offers 2 types design: oil field skid mounted 500GPM mud recycling system, and fast movement mobile unit. Water well drilling operators prefer mobile unit for fast movement. The system is equipped with wheels; it is very convenient for movement. As water well is not deep size. It will be finished in some months. The drilling rigs are normally moved frequently, so it requests the fast movement of mud recycling system. 1) The single frame design trailer skid for mobile mud system can spare more space for usable mud storage volume. 2) The single frame design trailer skid for mobile mud system is with less ground friction. It can spare more fuel for operators. 1) The 500GPM mobile mud system consists of 3-stage solids control process: 1 set linear motion shale shaker for the 1rst stage solids control. 3-in-1 mud cleaner for the 2nd and 3rd stage solids control. 2) The 500GPM mobile mud system consists of mud mixing hopper and mud mixing pump to prepare new mud for rigs. 3) For a more compact design, the feeding pumps are mounted on tank slope, mixing hopper mounted on the tank top, while the mixing pump are mounted on tank skid, together with the ladder. 4) GN 500GPM mobile mud system utilizes composite materials replacement screen for reliable performance and loner lifetime. 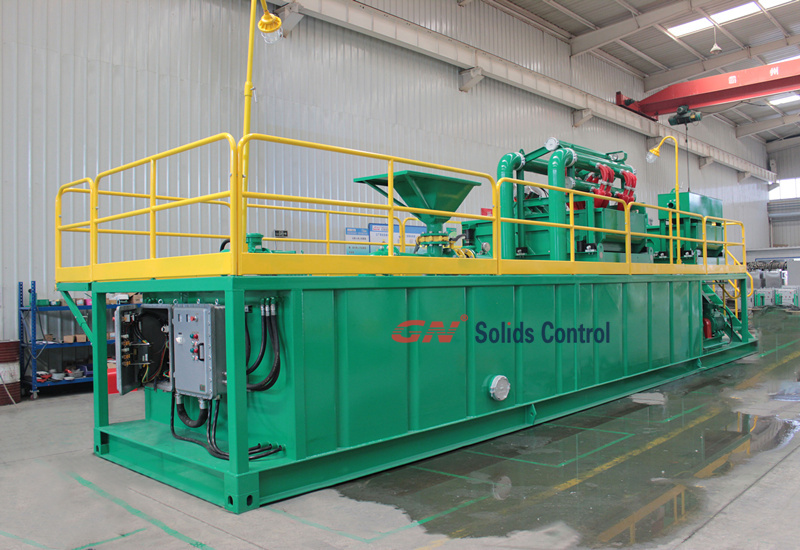 GN Solids Control can offer customized solutions to meet clients’ special demands. Welcome you contact GN Solids Control for proposal.